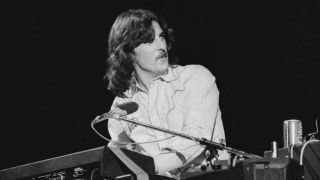 Welsh keyboardist and composer, best known for his work with Man and Pete Brown, has passed away. Welsh prog pioneer Phil Ryan, a founder member of the Eyes Of Blue, Man keyboardist and poet Pete Brown’s musical partner of over 45 years, has passed away on April 30 in his adopted home of Denmark. Born in Port Talbot in October 1946, he formed the Smokestacks in 1964 before joining local soul band the Eyes Of Blue two years later. The band secured a record deal with Decca after winning that year’s Melody Maker Beat Contest but the two singles chosen for them to record didn’t sell, resulting in a move to Mercury. By 1968’s recently-reissued Crossroads Of Time debut album, the band were forging templates for an expansive new musical form then called “classical rock” but best described now as “progressive”. Ryan’s big riffs and jazz-classical flourishes were influenced by Hammond organ-toting jazz-blues pioneer Graham Bond, who also gripped the likes of Jon Lord and Keith Emerson, and wrote the album’s title track and Love is The Law. Although acknowledged as a major influence on the nascent Yes, the album didn’t sell, but producer Lou Reizner managed to clinch a follow-up, In The Fields Of Ardath. The album started with Merry Go Round; recorded at Quincy Jones’ request for a film called The Toy Grabbers, and which started Ryan’s friendship with the legendary producer. In Fields Of Ardath consolidated the band’s experimental leanings, with complex, neo-classical arrangements and jazzy flavourings. Ryan made sure to homage Bond again by beautifully covering his Spanish Blues on an album which laid essential foundations for prog as we know it. Phil Ryan (far left) in Man. Through Reizner, Ryan started getting work as an arranger, which stood him good stead when Eyes Of Blue broke up in 1970. He then joined Piblokto!, the band started by Pete Brown, a veteran London jazz-poet who had written lyrics for some of Cream’s best-known tracks, including White Room and Politican. In 1972, Ryan joined Welsh psych-rockers Man, playing on Be Good To Yourself At Least Once A Day, Christmas At The Patti and Back Into The Future, before splintering off to form the Neutrons, which reunited him with former Eyes Of Blue drummer John ‘Pugwash’ Weathers, then playing with Gentle Giant. The band released 1974’s Black Hole Star album, trailered by a single dedicated to Graham Bond called Dance Of The Psychedelic Lounge Lizard, before 1975’s Tales From The Blue Cocoons heralded the band’s split and Ryan’s return to Man, who were also about to call it a day. Ryan toured with Gallagher & Lyle before hooking up with Brown again in 1977 when the pair worked on a score for a BBC TV film. He maintained the relationship after moving to Denmark in 1980, where he married actress Bolette Bernild. Ryan and Brown released two albums, Ardours Of the Lost Rake and Coals To Jerusalem, which were compiled into a CD called The Land That Cream Forgot. Ryan also continued working as a composer and musical director for Danish theatre, became the house composer for Comedievogen and on Danish radio. Ryan rejoined the rejuvenated Man in 1996, playing on 1998’s 1998 At The Star Club and 2000’s Endangered Species before taking time out to look after his terminally ill wife then rejoining in 2007 to play on Kingdom Of Noise and 2015’s Reanimated Memories. He released further albums with Brown, including 2010’s Road of Cobras (featuring Arthur Brown, Maggie Bell, Mick Taylor and Jim Mullen) and 2014’s Perils Of Wisdom.